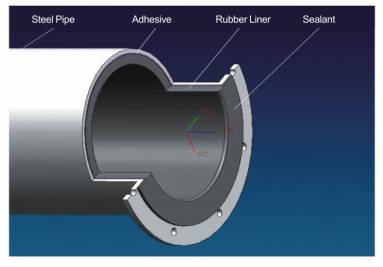 Rubber lined composite pipe employs common steel pipe as framework and imported anti-wear anticorrosive rubber as liner. The two parts are connected by adhesive. Thus, composite pipe for mine has the dual advantages of steel pipe and rubber materials. Nowadays, it has become the first-choice mining transportation equipment. Rubber lined composite pipe is mainly composed of metal framework and rubber. Select appropriate mode of composite pipe for mine according to various minerals and slurry. 1. Rubber lined composite pipe should be packed in iron cases. 2. Ocean shipping and land transportation are both available. 1. L/C and T/T are two available types of payment. 2. Rubber lined composite pipe should be delivered within 30 to 60 days after receiving down payment. Field installation and maintenance will be provided basing on that purchase orders of composite pipes for mine reach a certain amount. With development of eight years, Jiangxi Naipu has accumulated quite a little experience both in designing and manufacturing rubber lined composite pipe. The company has Chinese first-class mining equipment designing capacity and new material developing ability. Naipu also has advanced manufacturing machines. For another, the company builds up close technological relationships with institutes and universities. All our products are certified by ISO9001 and ISO14000.